Story: Felix Abbot was a computer nerd who lived his life at his computer. He was a good hacker and financed the equipment he needed for his activities by hacking into banks. There was one thing he couldn't get with his computer: The woman Claudia. In his obsession with the woman, he followed her around until the day her boyfriend caught and humiliated him . One day he gained access to CyberData , here he designed a suit from the available S.H.O.C. configurations which was sent to him. CyberData discovered his intrusion into their system and went after him. With his new powers he sought out Claudia and killed her boyfriend . What happened next has not been revealed. The next time he surfaced, he had taken the name Death's Angel and was trying to conqueror the world from a submarine. Onboard the sub, there was harem of captive women; it is possible that Claudia was among the women . Codename: Strykeforce stopped him and he escaped in the submarine's escape capsule. The capsule turned out to be defect and instead of sailing to safty the capsule went to the bottom of the ocean . 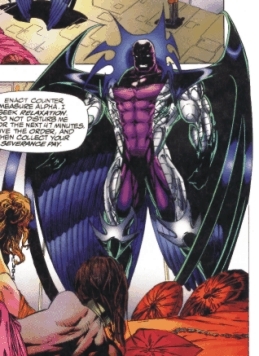 After Strykeforce defeated him, Death's Angel was stuck on the bottom of the ocean in his escape pod where he slowly withered away for the following year until the Shu'rii who wanted revenge for Shrr'nnn's betrayal . When Cyber Force and Strykeforce had defeated the Shu'rii, they were teleported to the Abbott residence giving both Felix and his mother a shock. It is unknown if Felix Abbott survived the shock . Equipment: Abbott wore a specially designed S.H.O.C. armor.